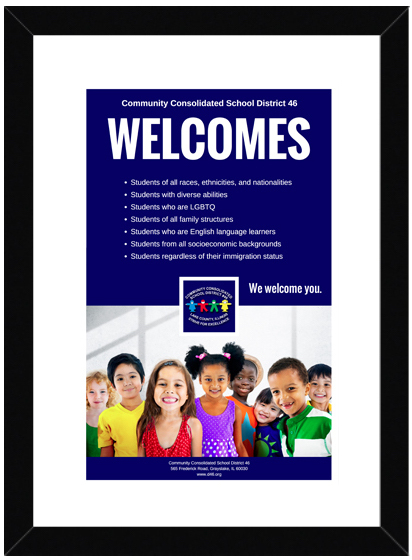 CCSD 46 WELCOMES students of all races, ethnicities, and nationalities; students with diverse abilities; students who are LGBTQ; students of all family structures; students who are English language learners; students from all socioeconomic backgrounds; students regardless of their immigration status. We welcome you. By Paul C. Gorski for EdChange - September 18, 2010. More information available from EdChange. Originally adapted from Without Bias: A Guidebook for Nondiscriminatory Communication, Second Editions with permission from John Wiley & Sons, Inc. An Anti-Defamation League publication. More information available from the Anti-Defamation League. Originally adapted from Commitment to Combat Racism by Dr. Beverly Tatud & ndrea Ayvazian in White Awareness: Handbook for Anti-Racism Training by Judy H. Katz. An Anti-Defamation League publication. Why Is It Important to Teach Young Children to Appreciate Diversity? An online article by Marcia Powell on the EducationWeek website. Read the article on Education Week Teacher. By Paul C. Gorski for EdChange and the Multicultural Pavillion.